Register before 08 Feb 2019 for only RM5,300 per person. Register before 28 Mar 2019 for only RM5,300 per person. Register before 05 Jul 2019 for only RM5,300 per person. The CompTIA® Network+ certification course develops on your current user-level knowledge and experience on the operating systems of personal computer and networks with fundamental skills and concepts that can be applied on any networking career. 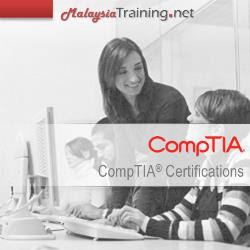 If you wish to pursue CompTIA technical certification, the CompTIA A+ certification will be a good start before taking the CompTIA Network+ certification.